The nature of community is collaboration, and while it’s no surprise that Next Gen-ers often get together to make magic happen, this newest project is set to be a game-changer in the podcast space. The latest in Next Gen collaborations? 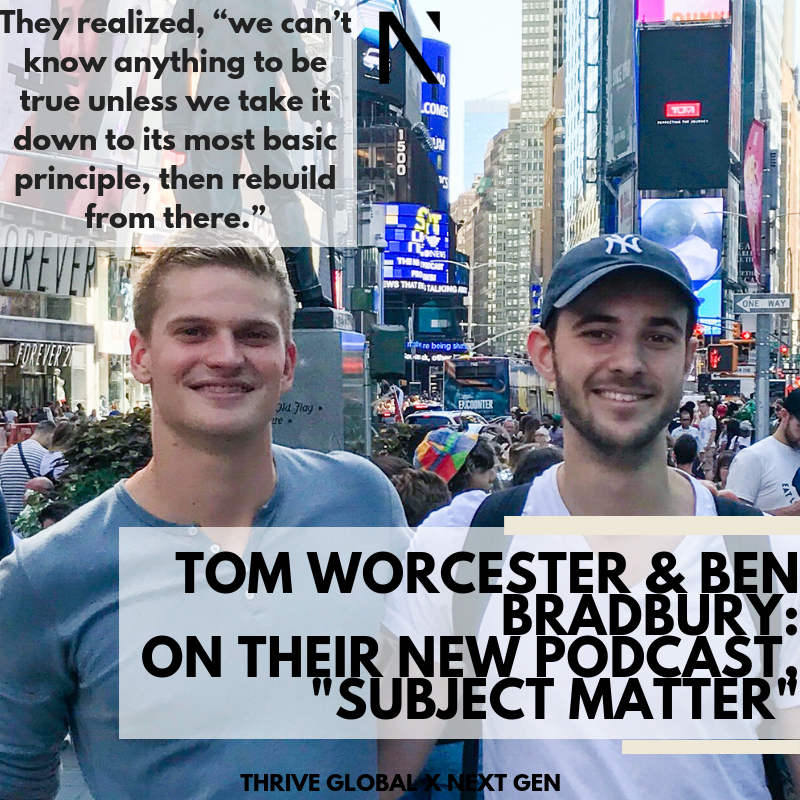 New podcast “Subject Matter,” by co-hosts and Next Gen members Tom Worcester and Ben Bradbury. In all of the stories behind Next Gen collaboration, there’s a bit of serendipity – and the story behind “Subject Matter” is no different. At the Next Gen Summit 2018 back in June, Ben and Tom were inspired by Patrick Lee, the founder of Rotten Tomatoes, so much so that they both felt compelled to speak with him afterwards. “I went up to speak with Patrick and caught the tail end of Tommy telling him that he likes the way he thinks, which is exactly what I was going to tell him,” Ben shared. As with all stories of serendipity, timing is everything. “I was struggling with trying to decide if I should move back to London,” Ben admitted. So, Ben and Tom promptly went to lunch and began to talk it through. One lunch wasn’t enough. “After five hours, I walked away with this comprehensive document of who I truly was,” Ben shared. The idea, of course, was the podcast – Subject Matter. The premise was relatively simple: the podcast would explore ‘subjects that matter’… and debate them from both sides. The intention? To cast doubt in the heads of true believers in one side of an argument, and to open their eyes to the other side – marrying narrative and investigative mentality for a true intellectual ‘workout.’ They realized that it wasn’t until Ben was faced with the extraordinary pressure required for deep analysis. Subject Matter offers that same type of pressure and inquiry. They publish episodes weekly on Tuesdays, and the first season will have 15 episodes. Each episode tells stories about subjects that matter, but pulls the rug out from under the audience. They offer two perspectives – neither is right, and neither is wrong. They’re hopeful that this will “pioneer a new form of podcasting” with the intention to encourage people to think for themselves, rather than simply believing everything they read in the paper or watch in the news. I asked them, what is the most controversial discussion you’ve had to date? They shared that it’s an upcoming episode about how people make decisions (using data or with gut instinct). True to form, they play as each other’s devil advocate. Tom is in favor of data-driven decisions, using Jeff Bezos as an example. Bezos had noticed that between 1994 and 1995, the internet had grown by 2400%. Using this critical data point, he asked himself, “what makes the most sense given the context of this growth?” And that is how the idea for Amazon came about – and it was founded two years later. But there’s something to be said for instinct, too – and the story Ben uses to combat data-driven decisions is one of Erwin Rommel, a German general in World War II. Whereas Britain would decide when to attack based on past results, Rommel would command his army on instinct alone – spurring them into decisive action when he felt the timing was right, with devastating effectiveness. At the end of the day, however, both Rommel and Bezos won, although they were fighting different battles. And at the end of each episode, it’s up to the listener to decide which side they’d like to take… which could be very different to the side they originally sided with. That’s the power of Subject Matter. “I feel so incredibly lucky to have Tom as my co-host,” Ben beamed, and Tom immediately responded with the same sentiment. It’s crazy the things that happen when you simply want to compliment a speaker, isn’t it? If you’re ready to challenge your beliefs and learn about the subjects that matter from an entirely new perspective, you can tune into Subject Matter here. Connect with more entrepreneurs who are starting amazing things and forge connections for your own collaborations in the Next Gen Community! Request to join here.